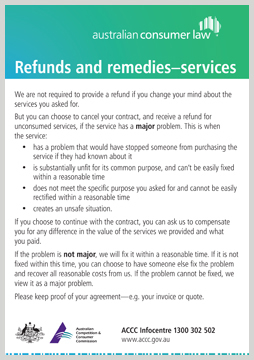 The ACCC, together with the state and territory consumer protection regulators, have developed a new point-of-sale sign to give consumers clear information about their rights to refunds and replacements as well as refunds and remedies under the Australian Consumer Law. Retailers nationally are encouraged to display the sign, to make it easier for consumers and businesses to resolve issues when consumers have a problem with goods or services they have purchased. The new consumer guarantees provisions of the ACL mean that businesses dealing with defective goods must provide a repair, replacement or refund, and if there is a major failure with an item, the consumer has the right to chose the remedy, including requesting a refund.